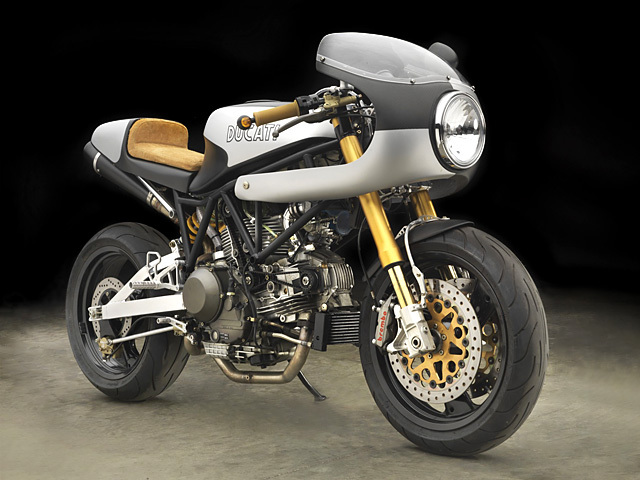 Not content to follow the café racer path of improving performance by reducing weight Moto Studio gave the Ducati donk a complete overhaul. 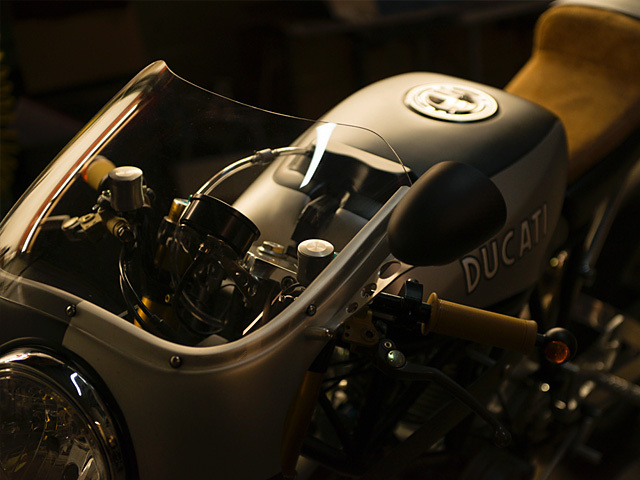 A set of high compression pistons were installed to increase the already torquey Ducati L- twin. While a Yoyodyne lightweight flywheel helps the engine spin up more freely and improve throttle response. The heads have been ported and a set of custom intake manifolds were designed and matched to the ports. Carburettors are the ever popular Keihin FCR 41 and are tuned to work with a custom made 2-1 exhaust system. Bruce McQuiston spent a lot time developing the carbon fibre reverse cone exhaust muffler, which not only performs flawlessly, but produces amazing exhaust notes and is completely serviceable. 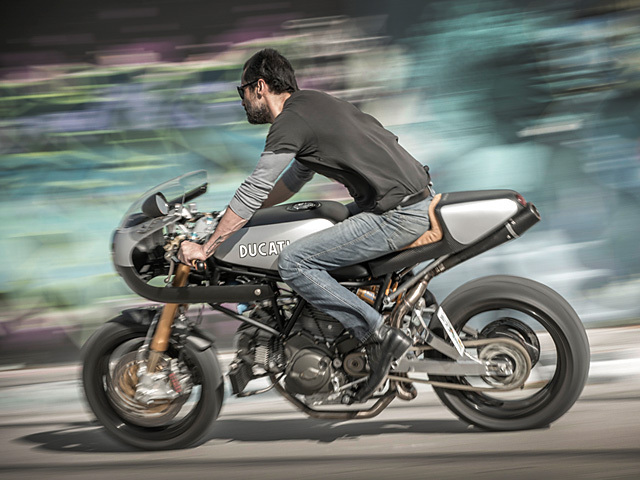 The fitment of upside down forks to a modern café bike is not a unique feature in 2014. But there are forks and then there are the gold Swedish jewels known as Ohlins and Moto Studio would accept nothing but the best. The fronts are Ohlins road and track versions which give the rider full adjustability while the rear is taken care of by a single 3-way adjustable shock from the big Swedish firm. With handling now taken care of, equally impressive stopping power was a must and nothing matches a set of Ohlins like radial twin disc Brembos! 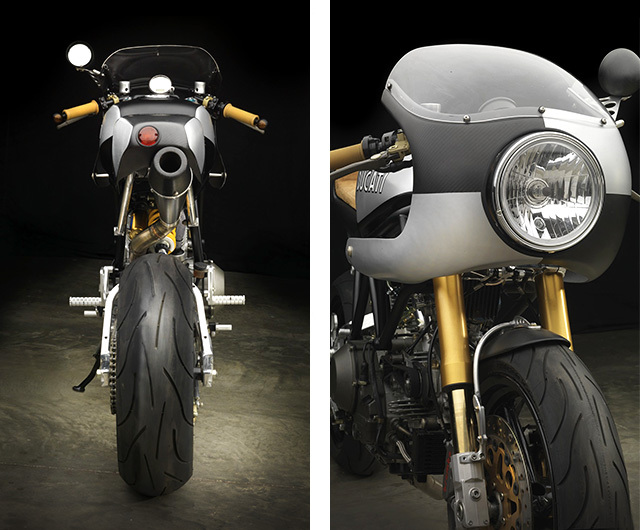 Now with the motorbike version of a tomahawk missile built and ready for urban assault Moto Studio set about giving the 900ss the sort of looks that make it as impressive standing still as it is carving the canyons. Bruce set about hand sculpting the body parts from carbon fibre, having already modified the frame to suit his design. 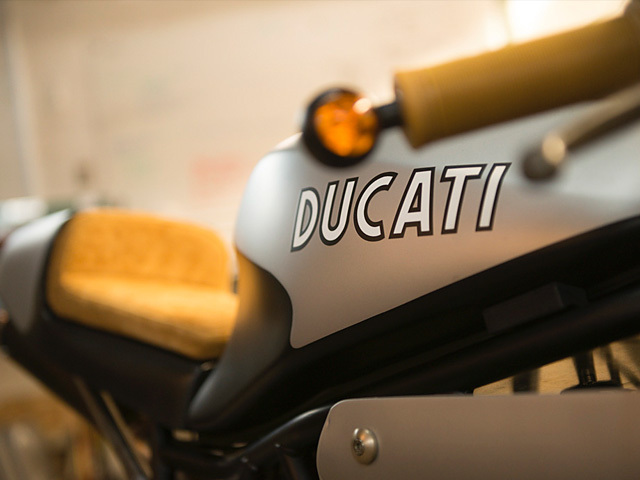 The seat cowl, front fairing and mirror housings are perfectly constructed carbon that features a Ducati flavour with a rich custom touch. The paint scheme was designed to accentuate the mechanical components of the bike while showing off brilliantly the handmade body work. 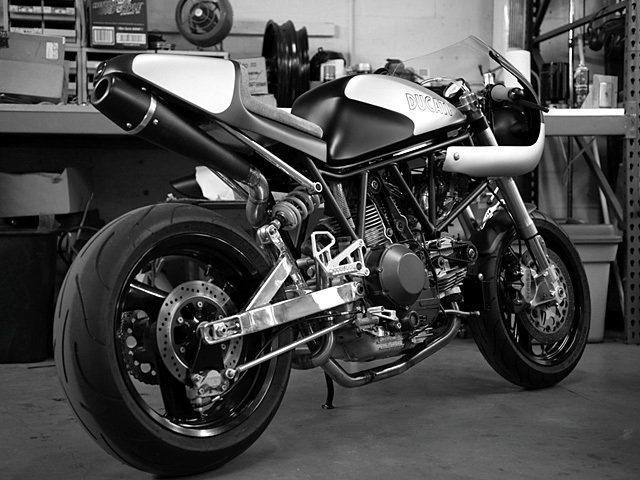 Moto Studio takes it’s wiring seriously and the clean look of the Ducati is testament to their painstaking work. Utilising exclusively Motogadget components and with their proprietary wiring harness you only see what you should and any builder will tell you how hard that is to achieve. 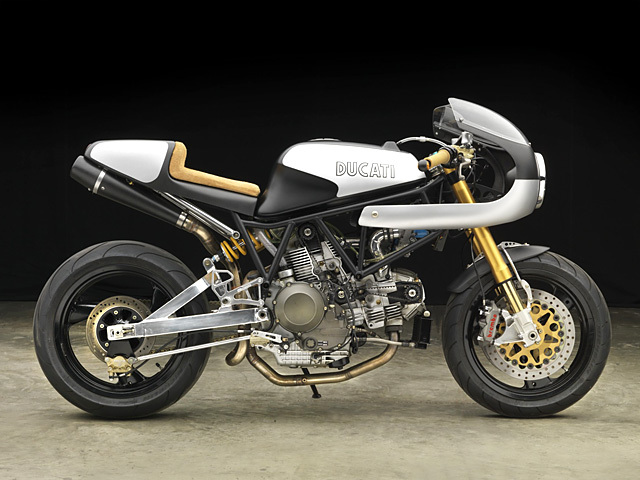 At just 321lbs (145kg) this is a featherweight Super Sport with the very best of stoping and handling prowess, dressed in 21st century body work and with a barking mad motor, this is truly a fine Italian more than deserving of the original lust worthy 900ss name.